This year’s Abu Dhabi Art Fair is different, everyone said. New participating galleries, an engaging programme of talks, Guggenheim’s long awaited exhibition Seeing Through Light, and Beyond - a section consisting of large scale installations, placed all over the venue. Agreed, it was something else. Even more so as this year, my status changed from visitor to exhibitor. Among other privileges, this entailed rubbing shoulders in the breakfast room of the St. Regis with the big fishes - Kamel Mennour, Kashya Hildebrand, Leila Heller, to name a few. What a surreal experience over morning coffee! 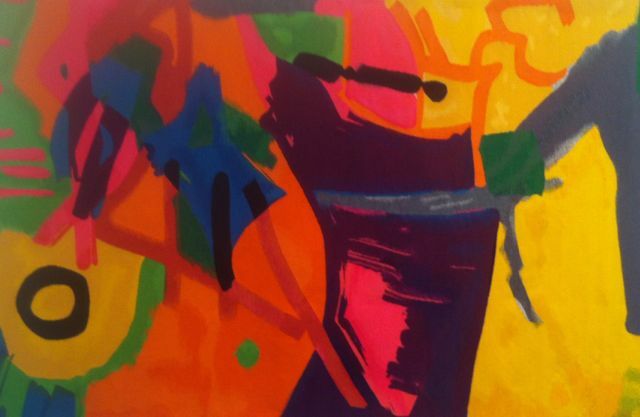 A multicolor tapestry designed by the Lebanese - American polymath Etel Adnan. Seen from afar, the textile resembles a canvas, its threads taking the appearance of vigorous brushstrokes. The multitude of shapes dancing around the fabric is a refreshing sight compared to Adnan’s emblematic, geometrical tidiness on canvas. 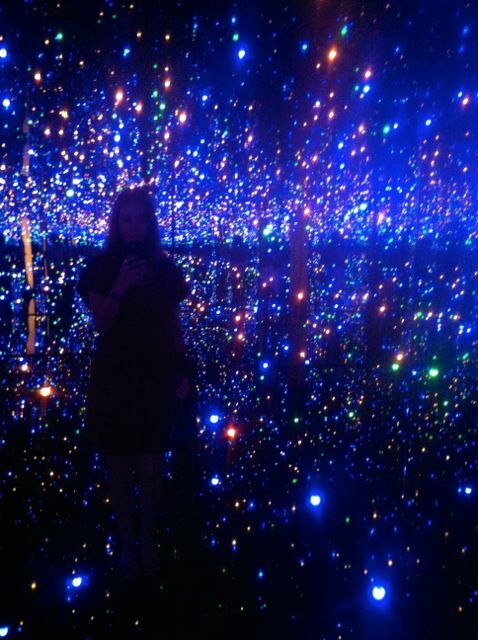 At the Guggenheim’s Seeing Through Light exhibition, Japanese artist Yayoi Kusama’s mirror-panneled installation stole the show, whether in the room or on social media. Accessible through a narrow passageway delimited by water, her Infinity Mirrored Room is the playground to hundreds of LED lights regularly changing colour and intensity, creating the illusion of an overwhelming sensory experience. 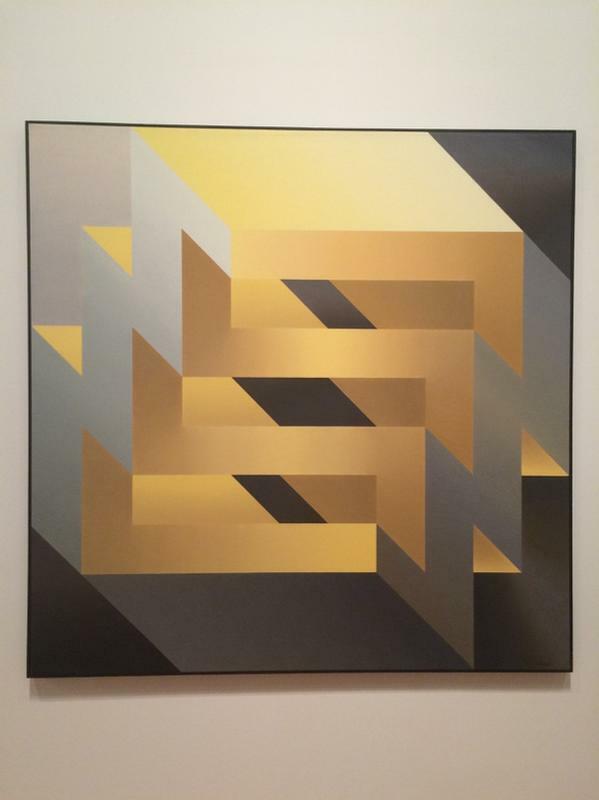 Saving the best for last, here’s another one from Seeing Through Light - Yellow Spiral by Samia Halaby. Pioneer of abstraction in the Arab world, the Palestinian artist’s 1970 piece is an homage to Arabic architecture and calligraphy. Notably, it is the only painting included in Guggenheim’s exhibition, exploring the role of light in artistic practices through a number of installations. Alhtough Abu Dhabi Art Fair is now over, Seeing Through Light exhibition presenting the Guggenheim Abu Dhabi's collection still runs at Manarat Al Saadiyat through 19 January 2015.